Providing you the best range of dynamometric 1ph / 3ph power meter, electronic led frequency meter, power factor meter, synchroscope meter, true rms onsite programmable digital panel ammeter and true rms onsite programmable digital panel voltmeter with effective & timely delivery. Scale Linear, Side zero or Center zero are available. Dynamometric 1ph / 3ph Power Meter instruments are used for measurement of active, reactive & absolute power in 1 Phase & 3 Phase systems for balanced / unbalanced load conditions. Watt, Var & VA instruments incorporate current coils, connected in series with the load & pressure coils connected to the load. These instruments work on "Air cored Electro-Dynamometric" principle. Dielectric Strength 2kV RMS for 1 minute. Response Time Less than 1 sec. Insulation Resistance Greater than 20 M ohms at 500 V DC. Operating Voltage 110V~125V, 220V-250V, 380V~440V. It is used to measure the applied frequency, functionally similar to vibrating reed meter. The meter incorporates light emitting diodes LEDs which are used instead of vibrating reeds to indicate applied frequency. The frequency is determined by blinking LEDs. When applied frequency matches with the frequency marked on the dial, that particular LED blinks with maximum intensity. When the applied frequency is midway between two adjacent LEDs, both LEDs blink. When the meter is switched on all the LEDs glow sequentially for a period of 1 to 1.5 seconds, thereafter it will indicate the applied frequency. All voltage ranges are available in a single meter. Terminal screws with washers are provided only for specific voltage as per requirement & remaining two terminals are covered with insulated caps. In case of 96mm & 144mm instruments, two sets of LEDs with the same scale range can be offered, giving two independent meters in one casing (Dual Scale). This facilitates in comparing the frequency of two voltage supplies for paralleling operation. Visible in dark & from distance. 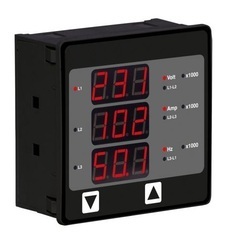 Power Factor Meter incorporates two pressure coils one with non-inductive resistance in series & other with capacitance in series & are cross-connected. The deflecting torque produced is proportional to the phase angle between current & voltage vectors. The pointer rests anywhere on the scale when a meter is not connected to the circuit, as there is no controlling torque. Insulation Resistance Greater than 20 Mohms at 500V. DC. 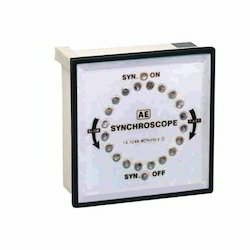 'AE' SYNCHROSCOPE is categorized into two types A) Electro-mechanical and B) Electronic. It incorporates a POINTER and LED to indicate synchronising condition. If the generator- (II) frequency is higher or lower than that of mains- (I) the pointer rotates in clockwise or anti-clockwise direction respectively. The speed and direction of rotation depends upon difference in frequencies, which guides the operator to speed-up or slow-down the generator. Synchronising condition is determined by dark lamp method, wherein the pointer coincides with synchronising mark and the LED does not glow. The LED glows in accordance with difference in phase, frequency and amplitude of voltages. When the pointer is towards the bright LED, it indicates the antiphase condition. Insulation Resistance Greater than 20 Ohms at 500V DC. Humidity Up to 95% RH. It measures true R.M.S. value of sinusoidal and nonsinusoidal voltage or current signals. WEIGHT (Approx.) 600 gms. 850 gms. 850 gms. 825 gms. INSULATION RESISTANCE Greater than 20 Mohms at 500V DC. OPERATING TEMP. 0 to 55 C.
STORAGE TEMP. -20 to 70 C.
Operating Voltage 110V~125V, 220V~250V, 380V~440V. It is used to measure the applied frequency. Vibrating Reed Frequency meters indicate the supply frequency by means of individual reeds, when rated voltage ± 20% is applied across the terminals of the meter, the particular reed, whose natural frequency of vibration coincides with the supply frequency, vibrates with full amplitude. In case the supply frequency falls midway between two reeds both the reeds vibrate, at reduced amplitude. The amplitude of vibration at the tip of reeds is high enough for a distinct indication. The instrument can be operated at 110V, 220V, or 440V. Terminal screws with washers are provided for the selected operating voltage & remaining two terminals are covered with insulated caps. 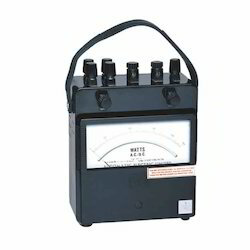 Type "WATT METER 1Ph UPF"
Instruments with accuracy class 1.0, 1.5. Instruments with multiple scale (refer table). Robust housing suitable for schools, workshops, field operations, for continuous use. Moving Coil Instruments are protected from damage or breakage under adverse conditions due to spring loaded jewel & pivot system. These Instruments are free from external magnetic field influences because of centre magnet system and are "CE" certified. SCALE COLOUR Special colour scales & marks for different ranges, (on request). TERMINAL PROTECTION Shrouded terminals to protect from accident, (on request). 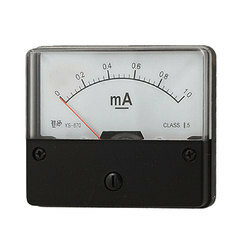 Our products Analog Meters continue to set the standard for quality with each of our analog panel meter families. 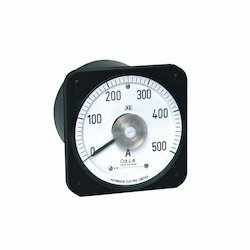 Our Analog Meters are preferable to digital panel meters when readings tend to fluctuate or oscillate and where extended monitoring is required to indicate trends or rates of change. 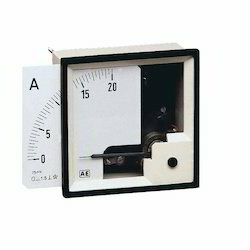 Analog panel meters are easier to read in bright sunlight or well-lit rooms and require no external power source. Maximum Demand meter is used for monitoring thermal loading in Power Distribution systems, Networks, Machines etc. It indicates maximum loading current over a period. Short-period current peaks are not registered but long overloads are registered. In the Maximum Demand meter the measuring current flows through the bimetal spiral which is temperature sensitive. The free end of the spiral is connected to a black measuring pointer. The moving system is activated by heat generated by the current flowing through the spiral. The instrument is provided with an additional red slave pointer with a higher friction, which makes it to remain at its maximum position, which determines the maximum average loading current. The high torque of metallic movement drags the red pointer along with the black pointer. The red pointer remains stationary at the maximum value reached. This can be reset by rotating the knob provided on front facia. To prevent false indication due to fluctuations in ambient temperature, an additional bimetallic spiral is wound in opposite direction, which is mounted on the same spindle to compensate variation in temperature from -10 to 55 degrees Centigrade. Frequently there is a need to measure instantaneous current simultaneously & hence moving iron movement having the same range is incorporated in the same meter. RMS measurement of maximum current. Long current peaks are registered. Red pointer to indicate maximum current reached. Moving coil instruments with circular scale of 240° employ a platinum taut band for suspension of moving coil assembly instead of pivot & jewel system. It is less prone to sluggishness & zero shift due to frictionless movement. 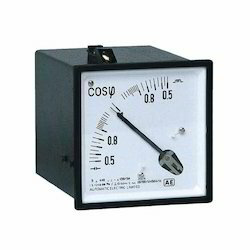 These meters are basically used for the measurement of DC current & voltage, and can be used with built in rectifier for the measurement of AC current & voltage in the frequency range 45~65Hz. / 400Hz. The meters measure average value. It can be scaled to indicate RMS values (on request). These instruments are not recommended for non-sinusoidal waveforms of current & voltage. The other indications like Frequency, Power & Power factor can be offered with suitable external transducers. Speed indication is possible if used with AC tacho-generator (not in the scope of AE). Moving Iron Instruments are protected from damage or breakage under adverse condition due to its spring loaded jewel & pivot system. These Instruments are free from external magnetic field influences because of magnetic shielding & are 'CE' certified. These instruments have a very efficient oil damping system, which gives almost a deadbeat movement to the pointer, without irksome oscillation. The movement is light yet sturdy and has a large torque to weight ratio which assures long life to instruments. These indicate true RMS values practically independent of waveform even of high harmonics. The scale is compressed initially. Readability starts from 10 to 15 degree approximately. Scale Colour Special colour scales and marks for different ranges, (on request).